Condor Liberation, seen entering Saint-Malo harbour, will remain out of service until December following the discovery of damages on her waterjets buckets. Following a routine dive inspection of Condor Liberation held on 23rd October, severe damages have been discovered on her three water jets, the devices that propel and steer her. Condor Ferries was forced to cancel all of her crossings until 6th November, after when she is heading to head to dry dock for routine maintenance until 13th December. Although Commodore Goodwill is still occupying Falmouth’s main lock, Condor Liberation already went on Thursday 26th October to Falmouth where she will remain laid up until works aboard Commodore Goodwill are completed. She will then immediately enter dry dock to be fully inspected and to benefit from routine maintenance. However, it has not been confirmed Condor Liberation will resume service afterwards, and may remain out of service until 2018. In order to accommodate affected passengers, Condor Rapide’s schedule have been turned upside down up to 6th November. Throughout this period, she will operate a Saint-Malo - Poole service via Jersey and Guernsey, departing at 08h00 (French Time) from Saint-Malo, returning in the French city just after 23h00. Besides, space has been freed aboard Commodore Clipper to accommodate all passengers at the closest date from their booked departure. It implies fewer freight can be carried aboard until Condor Liberation resumes service. Besides, all day trips to and from France have been cancelled, to give priority to the affected passengers. 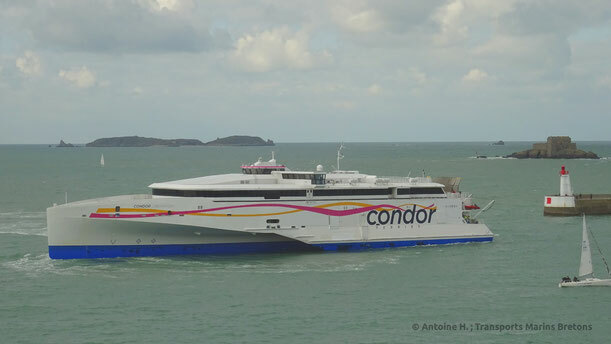 These damages are only the latest of a series that have been teasing Condor Liberation's service since her introduction back in March 2015, when she replaced both Condor Express and Condor Vitesse between Great Britain and the Channel Islands.